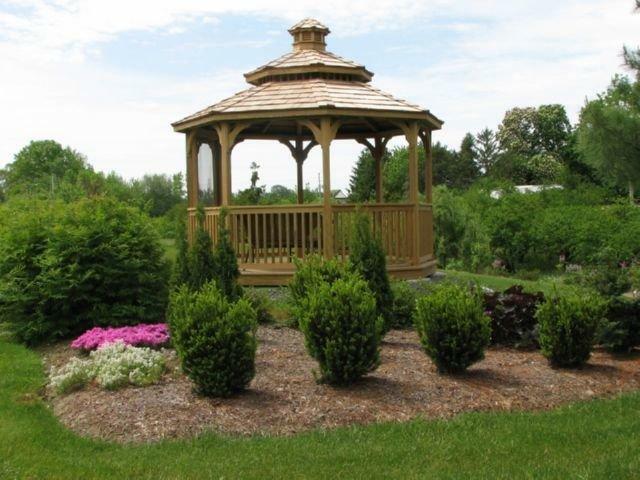 Wood Gazebos – For many, there’s just nothing like natural wood to complement any setting, outdoors or in. Read More about the superior “clear” hand-selected pressure treated lumber we use. Wood does require more care than vinyl, but lasts just as long. Our pressure treated lumber has a limited lifetime guarantee and is impenetrable to termites and fungus. When you see your gazebo up close, you’ll appreciate the fine craftsmanship with the scalloped edges on the posts, the rounded over railings and decking, and finish that is sanded from top to bottom. Exotic Woods – We are happy to quote you on redwood, oak, or cedar. With the advances in stain and pressure treated processes, we have been getting fewer and fewer requests. Our premium #1 “Clear” hand-selected lumber is perfect and then we mill it to make it even better – Even the deck boards are milled at our plant to be smooth and rounded on the edges, ready for bare feet on day one with no splinters or knots. According to the Southern Pine Inspection Board Glossary, “Clear” is defined as Free or practically free of all blemishes, characteristics, or defects. 3 piece laminated posts to prevent cracking. “Clear” lumber, not just #1 Premium so there are no visible knots. Stainless steel screws throughout including in the decking. Double 2” x 6” floor joists. Vinyl Gazebos- using superior building practices with the finest materials available so that your gazebo is both beautiful and durable. 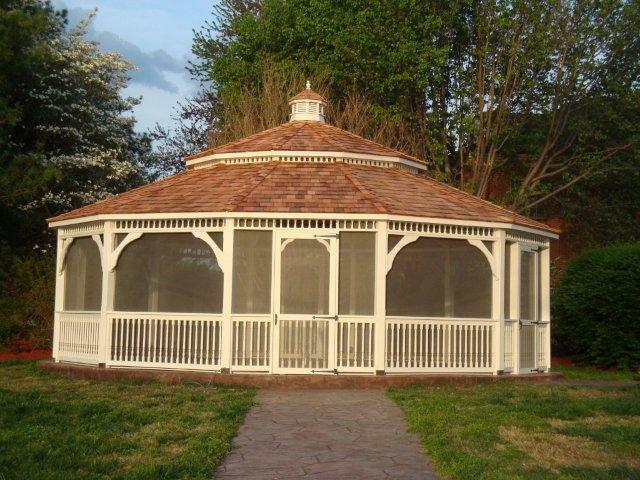 Not only will you be getting the best vinyl gazebo, but you’ll be saving money too. 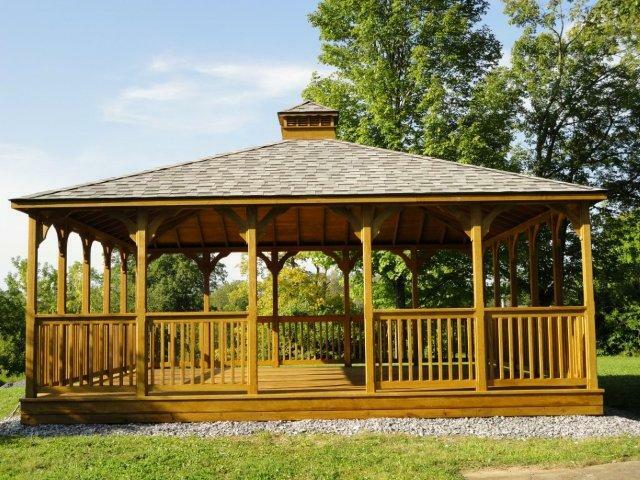 Your Amish Crafted Vinyl Gazebo will be a new escape, a place to join with family and friends, and a beautiful addition to any backyard, garden, or park. Perfect for hot tubs, swimming pools, and swim spas, vinyl gazebos can include screens or 3-season windows. 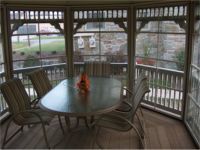 You can enjoy the openness of a gazebo, while experiencing the protection of a sunroom. Please read our Standard Features Guide and enjoy our growing gallery of vinyl gazebo projects. 1.The best for the money. Our features, materials, and construction practices stack up side by side with manufacturers costing thousands more. This isn’t just a claim. We provide an actual comparison and state the standard features included in our base price clearly on our website and brochure so you know exactly what you’re getting for your money. 2.Straightforward pricing and communication. We don’t play games with a low base price and then charge exorbitant prices for options that many people want, like a floor, stain, screens, or electrical package. The more options you want, the more competitive our pricing for the finished product. 3.Customization and Variety. Talk to us about the type of enclosure you want. It could be that a pavilion would be more suitable to accomplish what you want. 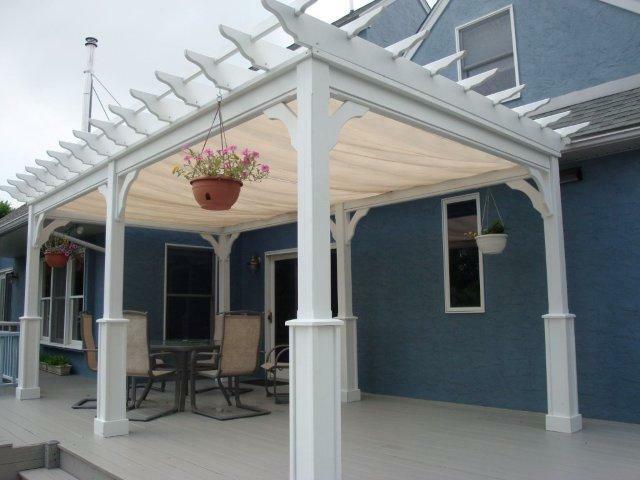 We make gazebo sunrooms, rectangular gazebos, sunrooms, sheds, horse barns and cabanas (which is part shed and part patio). Instead of just asking you for sizes and specs, we can discuss what you’re going to do with the space, how it fits into your overall property and your personal style. If you’re looking for a hot-tub enclosure, several possibilities will work. 4.Construction and Delivery Choices. You can choose between buying a kit and assembling it yourself, hiring someone to assemble the kit for you, having us assemble a kit onsite for you, or having the structure delivered assembled to your site. We’ll help you choose the best option and we can make it happen together. 5.Overall In Place Cost. People choose us, especially contractors, from all parts of the country, even though our plant is in Lancaster County Pennsylvania. Due to the efficiency of our operations and dedication of our employees, we are able to build kits and structures at a low enough cost that the difference more than makes up for shipping. 6.We buy more pressure treated lumber than most lumber yards. We don’t buy for the same price as your contractor. If you’re considering having your contractor build a deck, structure or even a room addition, get a price for the kit from us with a labor price from him, and then a total price from him. In many cases, it’s a win for everyone because our kits are so easy to put together. 7.Our builders are passionate about woodworking!